Two Filtro primitives allow the manipulation of colors. The Matrice di Colore primitive maps each RGB and Alpha value to a new value. The transformation is described by a 5×5 matrix with the bottom row fixed, thus a general transformation is described by a 5×4 matrix. The fifth column adds a value that is independent of RGB or Alpha, allowing for nonlinear color correction. Matrix: The full 5×4 matrix is defined. This is the most general case. Saturate: The saturation is reduced by specifying one number, s. The range of s is 0.0 (completely desaturated) to 1.0 (unchanged). Only the RGB values are changed. The exact formula is: R' = (0.213+0.787s)R + 0.715×(1−s)G + 0.072×(1−s)B; G' = 0.213 ×(1−s)R + (0.715+0.285s)G + 0.072×(1−s)B; B' = 0.213 ×(1−s)R + 0.715×(1−s)G + (0.072+0.928s)B.
Hue Rotate: The hue is shifted by specifying one number. Like the Saturate case, only RGB values are changed. The exact formula is quite complicated. It is not just a red to yellow to green etc. rotation. 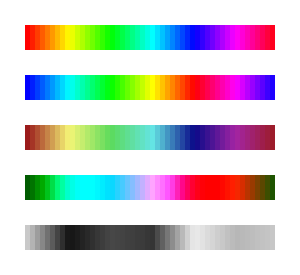 Luminance to Alpha: The luminance is converted to Alpha via a fixed formula: Alpha= 0.2125 × R + 0.7154 × G + 0.0721 × B (from ITU-R Recommendation BT709, the HDTV color standard). Examples of using the Matrice di Colore primitive. From top to bottom: Source object. Matrix mode set to swap red and blue. Saturate mode with input of 0.5. Hue Rotate mode with input of 90°. Luminance to Alpha mode. A «negative» can be made by setting the RGB diagonal matrix elements (a00, a11, a22) to -1.00 and the top three elements of the fifth column (a04, a14, a24) to 1.00. 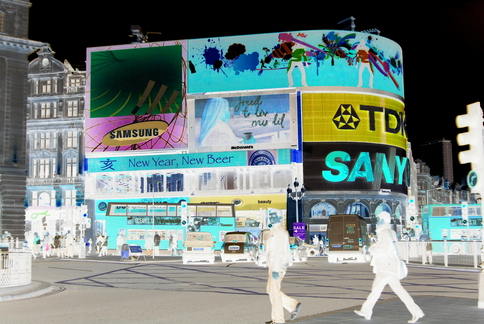 Creation of a «negative» using the Matrix mode.